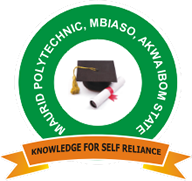 Maurid Polytechnic, Mbiaso, Akwa Ibom State National Dipoma, ND, Higher National Diploma, HND and Degree Admission Lists, Admission Letter Printing, School Fees Schedule, Hostel Accommodation Payment and Resumption Date for 2018/2019 Academic Session. This is to inform all candidates who applied for admission into the Maurid Polytechnic, Mbiaso, Akwa Ibom State various National Diploma, ND and Higher National Diploma, HND programmes that the admission list for 2018/2019 academic session has been released. Locate the Check Admission Status Button to confirm your admission status. Using the Box at the homepage Search for admission status using your phone number. You are to report to the institution from 8th April to 23rd April, 2019 for collection of ORIGINAL ADMISSION LETTER. Pay the sum of TWEENTY FIVE THOUSAND NAIRA (NGN 25,000) ONLY for ACCEPTANCE FEE at the Bursary Unit before collection of Original Admission Letter. Provide two(2) recent Passport Photograph. Provide O'level result (WAEC/NECO/NABTEB or equivalent). Provide your recent JAMB result slip. Your school fee is FORTY SEVEN THOUSAND, FIVE HUNDRED NAIRA (NGN 47,500) ONLY per Semester. Hostel accommodation is available and it's compulsory for all new students. Academic activities resume on immediately. From your location, arrive at ITAM PARK IN UYO, AKWA IBOM STATE CAPITAL, board a bus going to Afaha Nsit alight at the last bus stop then take a Bike (Okada) to the Campus in Mbiaso.